Did you know that your plants root system harbor fungi? Before you get alarmed, rest assured that this is a good thing. They are called Mycorhhizae, and they help keep your plants healthy. Mycorrhiza (or mycorrhizae plural) is a word derived from Greek that translates to 'fungus-root'. 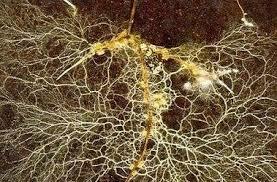 Mycorrhizae form a symbiotic relationship with plants' root systems. The mycorrhizae help plants to absorb nutrients such as nitrogen and phosphorus from the soil, and in return the plants produce carbon which feeds the mycorrhizae. Mycorrhizae also help plants to absorb water efficiently. It is a very complicated system which isn't fully understood yet, but that's it in a nutshell. Mycorrhizae are absolutely essential to a plant's health and survival. Unfortunately, there are many ways that mycorrhizal colonies can be destroyed. Tilling, crop rotation, soil being leveled for building, or the ground laying fallow can all cause mycorrhizae die-off. Crop when you plant, and re-mulch with it several times a year. It contains mycorrhizae, along with many other important plant nutrients. It makes a huge difference, and your plants will love it! And of course, we carry it here at the nursery.